Many types of flooring can be installed over a concrete sub floor. However, many homeowners are disappointed to discover that solid wood flooring cannot be installed on a concrete slab. Laminate flooring is a good alternative to wood flooring in basements. 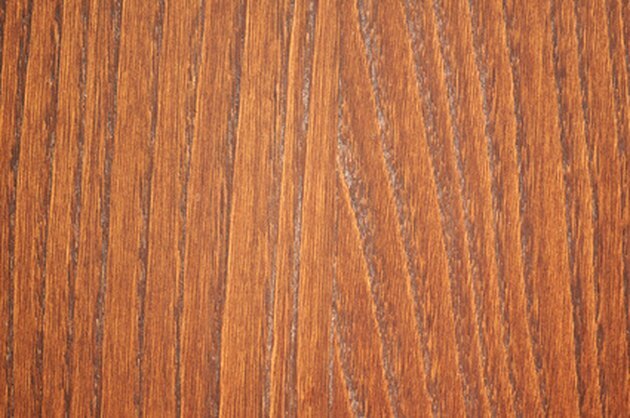 Laminate flooring is also fairly easy to install. 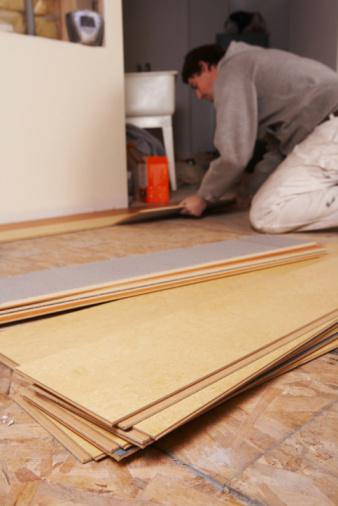 Homeowners can install laminate flooring on top of their concrete slab once they know where to begin. Remove the baseboards. The key to carefully removing baseboards in a room is having the right tools. A pry bar and hammer will help you to remove the baseboards without breaking them. Place a long level on the floor to see how level the concrete slab is. There should not be a variance over 3/16th of an inch every 10 feet. Use a marker to mark the places that need additional work in order to be level. Use a concrete grinder to grind down any high spots on the concrete floor. Fill low areas on the floor with leveling compound. In a bucket, mix the leveling compound and then apply the compound to the floor with a trowel. Allow the compound to dry and check the floor again with the level, grinding off any high spots. Lay down a vapor barrier according to the manufacturer directions. Place the laminate flooring on the concrete slab in the room where it is to be installed. This will help to acclimate the flooring to the room temperatures and humidity. Leave the flooring in the room for three days before installation. Use a table saw to cut the tongue off from the first row of laminate flooring in your room. Lay the first row of flooring with the tongue side towards the wall. Make sure you are keeping an expansion gap (per manufacturer directions) on all walls in the room. Piece the first three rows of laminate flooring away from the wall. Once assembled, slide the rows of laminate flooring into place next to the wall. Cut each of the end pieces with a miter or circular saw. Cut the laminate with the back of the plank facing towards the saw. This will help to prevent chipping. Stagger the joints at least 12 inches from one another. Click the tongue and groove pieces together, inserting the tongue into the groove at an angle. When you cannot insert the tongue at an angle, use a tapping block and a hammer to tap the tongue into place. Continue piecing the laminate flooring together until you reach the last row in the room. Use a jig saw to make any needed cuts for things like heating vents. On the final row, measure the distance between the wall and the last installed row of laminate. Subtract the expansion gap from that measurement and transfer the measurement to the final row of laminate flooring. Use a table saw to cut the final plank of flooring to size. Install transition strips and moldings. Re-install the baseboards. How Long Does it Take to Lay Laminate Flooring?